Next to those are our pretty canisters. We bought the gold ones from the Queen Mary Tea Room when we used to live right near it. (This was years ago. I'm not a big fan of throwing out expired tea, by the by.) La-di-da. I figured out later it was exactly the same tea as in those other, store-bought canisters, only it was cheaper at the store. Good for QM. Here's me on my 28th birthday, celebrating with a cuppa. Queen Mary's a good place to go if you enjoy borrowing tiaras, being scolded for not making a reservation on a midweek afternoon, and paying $20 for a cucumber sandwich. (Prices approximate.) It's an experience, in other words. 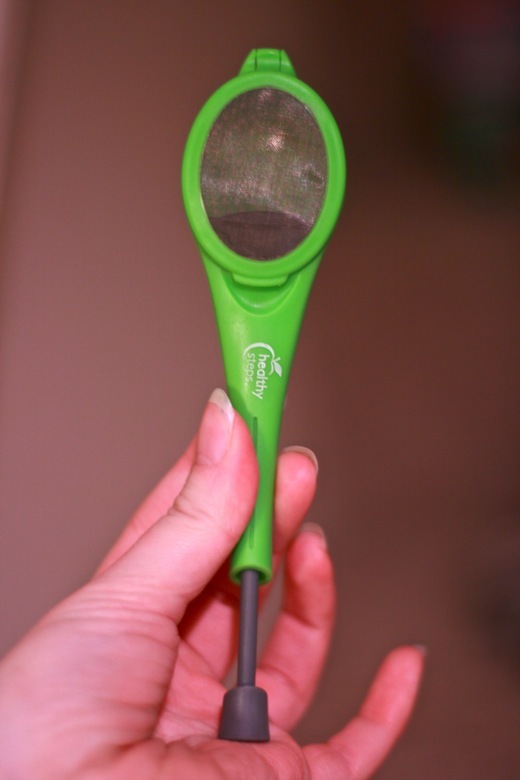 I also really love my simple mesh basket strainer. I picked it up at the natural foods grocery store, I believe, but here's a similar-looking stainless one online. Mine rests just inside the rim of our standard-size tea mugs (not sure it would work the same with the jumbo versions a lot of people have nowadays), which makes taking out the leaves and steeping them again easy. We also have a French press (not this one in particular but one like it), which I like for making the same tea for multiple guests, and a Libre tea glass (steeping upside down, above), which works great — and is pretty — for loose-leaf on the go. We used to have this electric kettle plus tea warmer , which was actually really awesome for having tea ready at a pleasantly heated temperature throughout the day. But then it started leaking through the on-off switch, which is not a good feature in an electric kettle. Out it went. This is my newest fun toy, a tea plunger , which the same friend recommended at her tea party. I found mine at the grocery store. I like that it helps me eyeball the correct amount of tea leaves to put in. 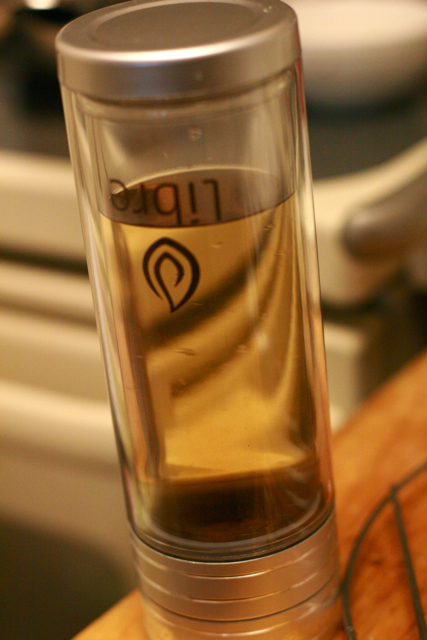 You just pop the tea leaves into the infuser, close it up, then set it in your cup of hot water to steep. You can even stir it around. And when using a tea that can stand rough handling, such as herbals, you can plunge the tip at the end to squeeze all possible water and flavor out. I had no idea I had this much to say about tea! Blah blah blah. These are some fun ones we've picked up here and there. I'll say that the more tea I drink, the more I appreciate it even unadorned and plain black (or green or white or…). If I do sweeten it, I favor raw honey. I've also found that a fun way to simulate a cream Earl Grey is to brew up some Earl Grey (or black tea with bergamot) and add a dash of vanilla. Yum! 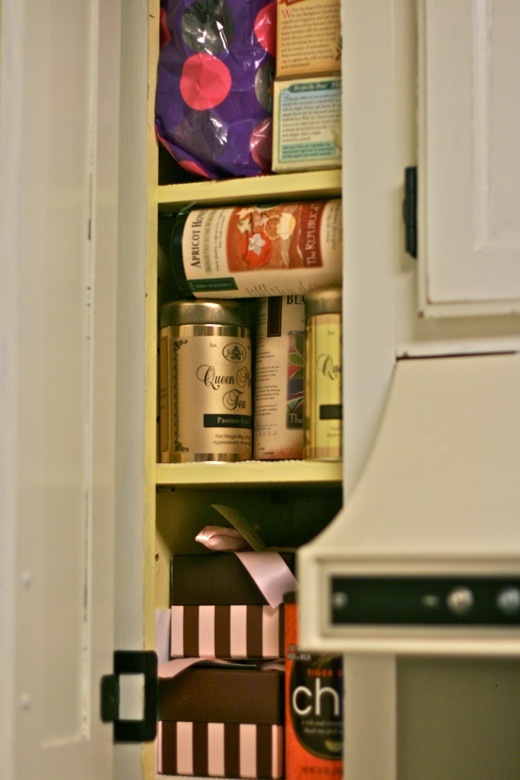 I have this sense that it's somehow embarrassing to have a selection of store-bought, tea-bag, flavored teas when displaying a stash to potential snobs. Ah, well, it can't be helped. 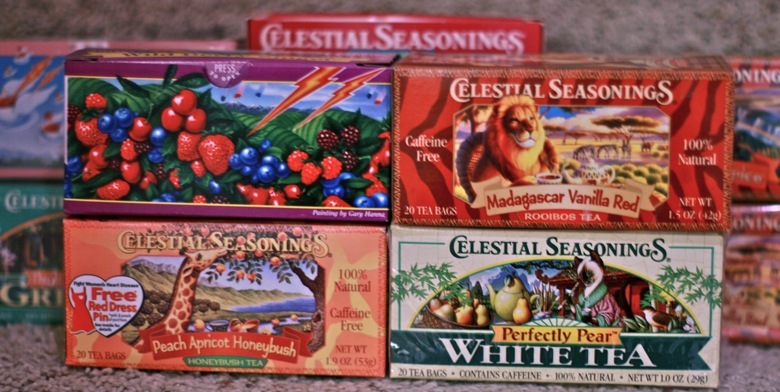 Because I love me some Celestial Seasonings. And let's face it, tea bags are easy. Woot. 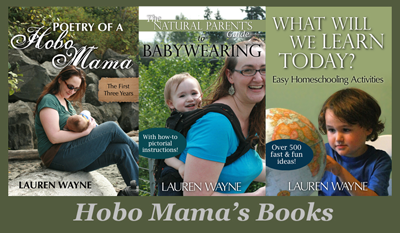 These are our four favorites. Wild Berry Zinger makes for some easily unsweetened iced tea. The Perfectly Pear White Tea I find to be very delicate in flavor, and lower in caffeine than black tea (which is a good thing when pregnant or nursing). I got into rooibos or red teas when reading The No. 1 Ladies Detective Agency series (yes, I am easily influenced by books), because Precious Ramotswe drinks honeybush tea, and I was curious. Sam loves the Madagascar Vanilla Red, which has a little spice to it. My favorite and, I like to believe, Mrs. Ramotswe's favorite, is the Peach Apricot Honeybush, which Celestial Seasonings discontinued. 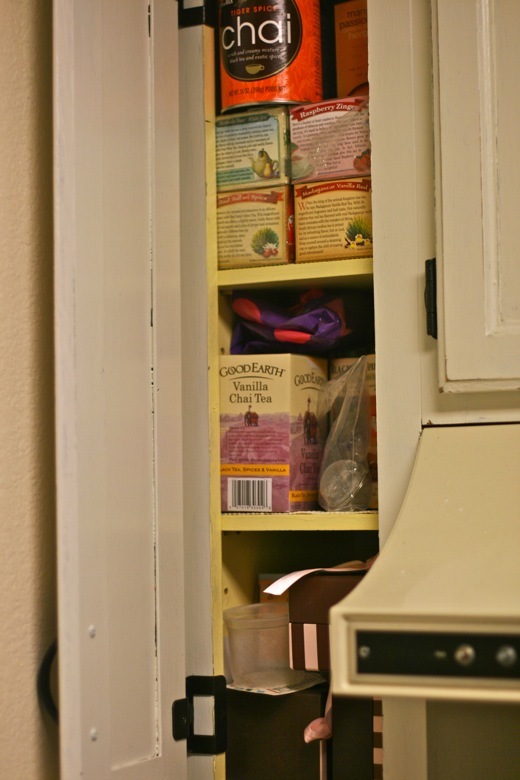 Take a look at these 5-star reviews , Celestial Seasonings, and have pity. 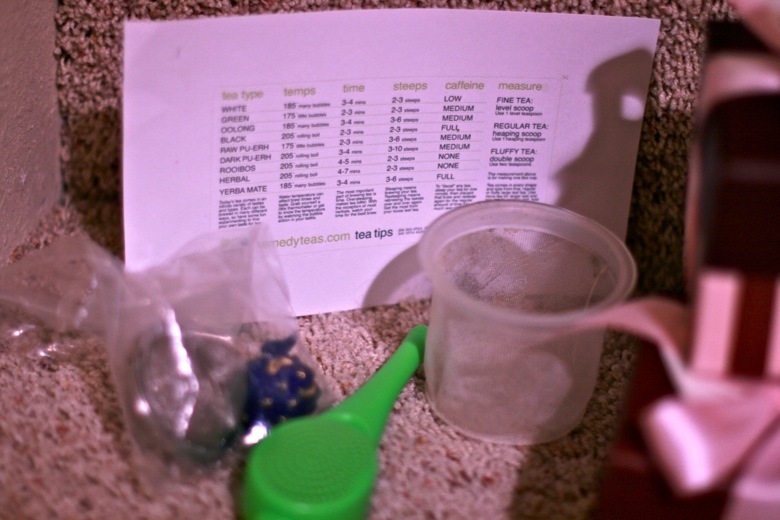 At the same tea party alluded to earlier, we all had a chance to share tea samples. I highly recommend swapping tea with friends! I could not for the life of me remember how this had all fit into the cupboard the first time. And someone was still yelling at me, so this will do. Since I'm putting this up so late for you to enter Strocel's link-up and giveaway, I will extend my own, lesser one. To anyone who comments on this post of mine in the next week, I'll enter you into a drawing to send you a sampling of some of my teas. That's all there is to it! 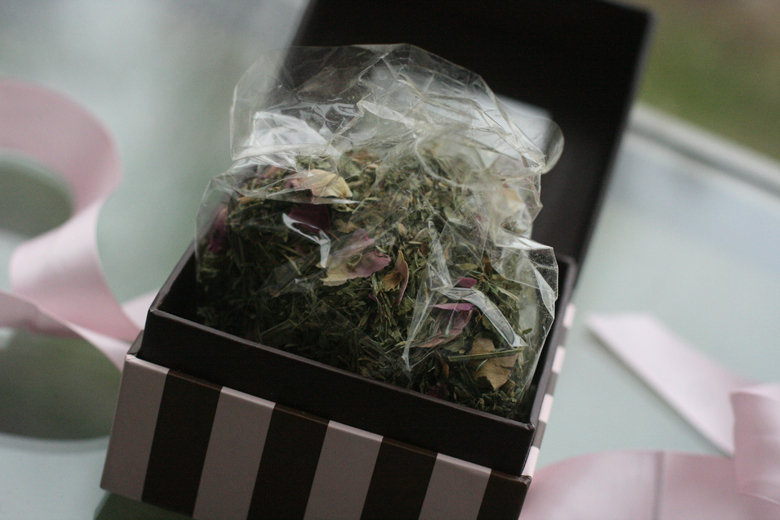 The packaging won't be fancy, but I hope you agree that the teas are yum. I'll choose one winner, and the contest is open worldwide. What are you favorite teas? 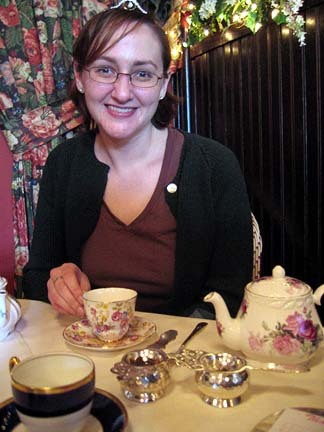 Disclosure: This is just me nattering about tea. for Sacred Rose and Libre Tea. I'm hosting the tea sample giveaway myself. 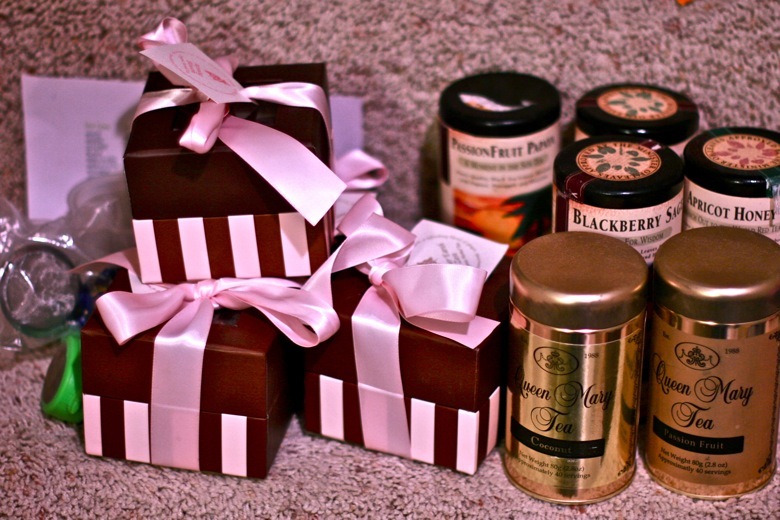 your tea stash is soo purrrty!!! I want to come over and drink some! I probably have just as many, but since they're dispersed worldwide, I wouldn't know... Time to finally live somewhere a bit more steady! 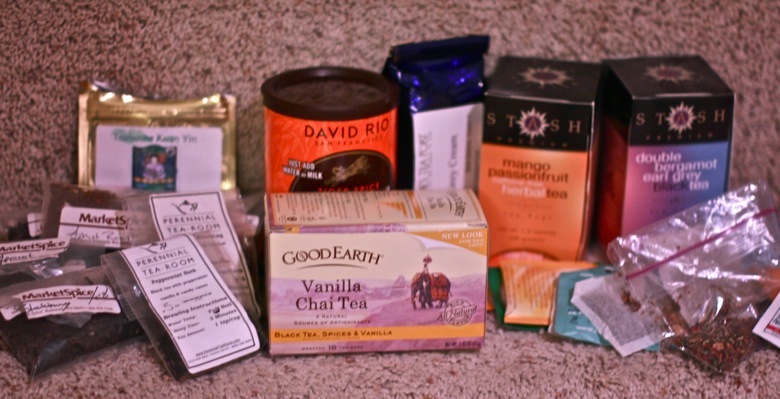 Thanks so much for joining in the tea-stash-sharing fun! I love me some Celestial Seasonings, too. I was raised on the stuff, in fact. 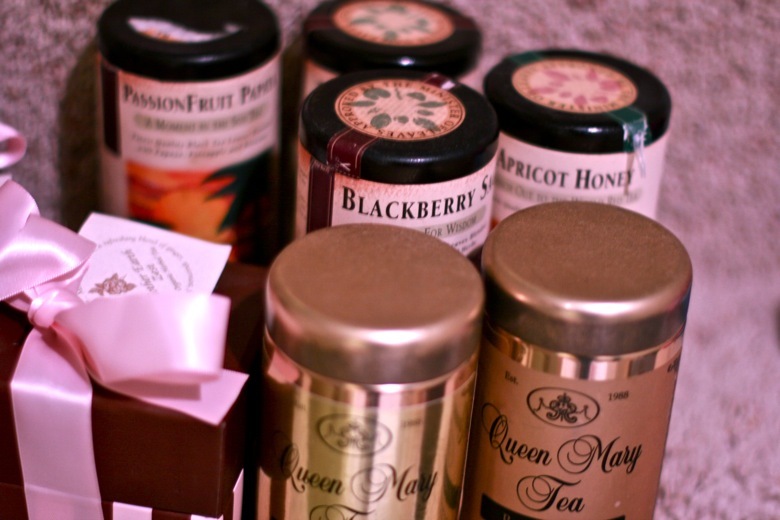 At my house we had tea (ie - Celestial Seasonings herbal tea) and caffeine tea (what everyone else just calls tea). I don't think I actually had "caffeine tea" until I was in my teens. Also, guess what? You won my giveaway! Your procrastination pays off. Your picture showing the raspberry leaf tea just brought back memories for me. 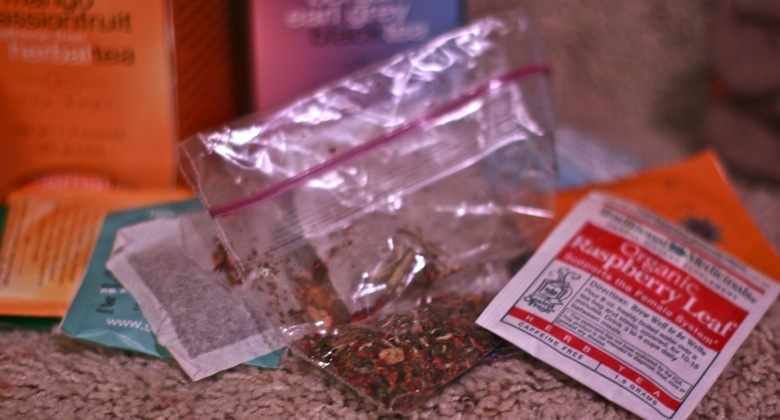 Red Raspberry Leaf tea became my go-to drink in my third trimester. It was this past June and July when the temperatures were blazing hot, so my sweet hubby would brew the Raspberry Leaf tea then cool it and mix it with either lemonade or iced tea and keep it in a pitcher in the fridge. It was wonderfully refreshing...especially mixed with pretty pink lemonade! We should go for tea when Amy comes to visit, minus the older, fire fighting children. Moira has also been fighting fires. So far no people have combusted, but the other night the table kept bursting into flames. I look forward to finding out what kind of imaginative play our trip to the sewage treatment plant will inspire. Bengal Spice is da bomb! Love it! Lauren, you definitely have a lot of tea accessories. You would have liked my mom. 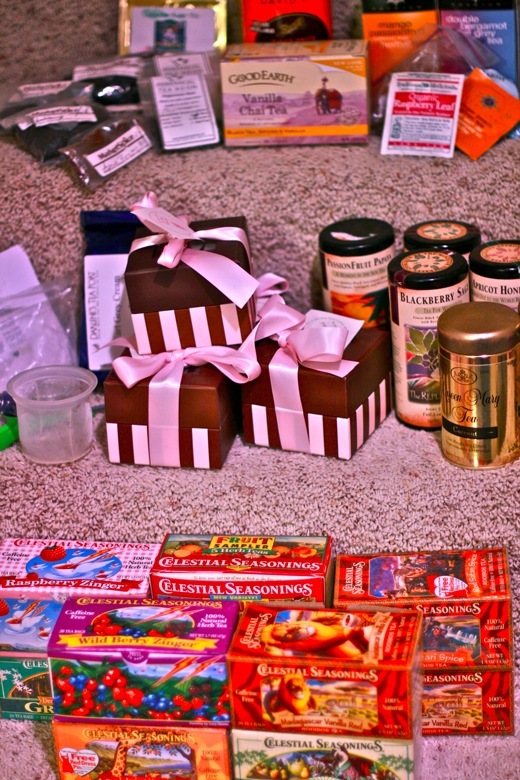 She was a bit of a "tea snob" and had tons of teas and tea things. :-) I used to love to have tea and shortbread cookies with her. 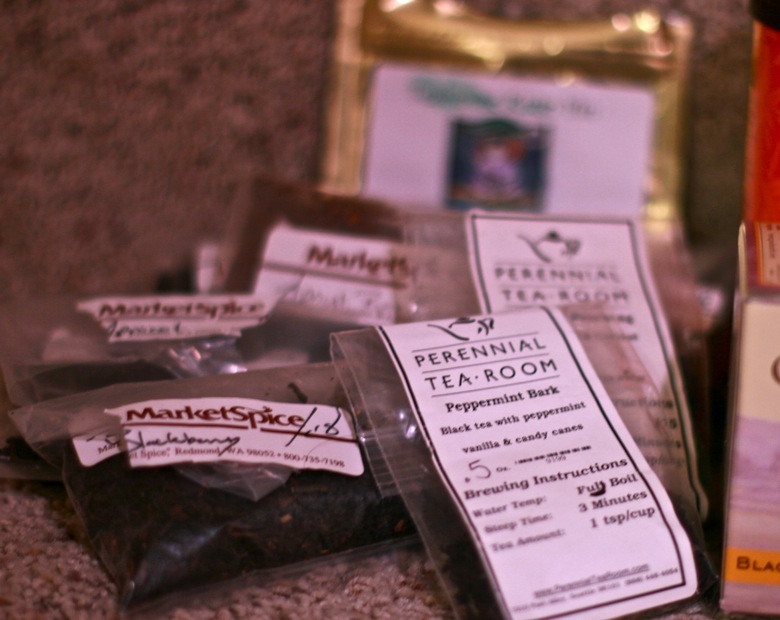 I love your tea ramblings! Excited to have a cuppa with you soon, fellow tea junkie. What a great post! I thought I had a good collection of tea...but I think I have some catching up to do! :) I have just recently started drinking tea more regularly. Right now I am really enjoying Peace Tea from Mountain Rose Herbs. I have an insane amount of herbal teas. They take up way too much space! Maybe I should put all the cold and flu and other therapeutic ones I don't use regularly in the closet where we keep our other therapies.